WestCONnex construction causing depression and asthma, residents claim | COMMUNITY ACTION ALLIANCE FOR NSW (CAAN): HOUSING INEQUALITY WITH AUSSIES LOCKED OUT! For those not directly in the path of the Toll Road and its Tentacles there is no compensation … instead they have to live with a motorway outside their doorway with constant noise and air pollution, respiratory disease, and loss of market value of their homes! 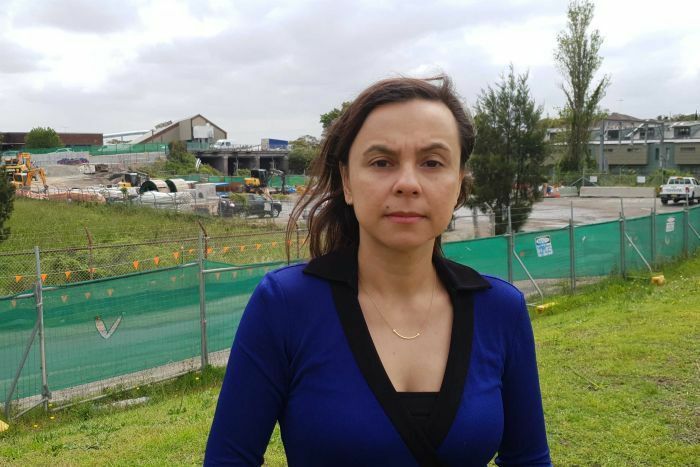 Residents near the controversial WestConnex in Sydney’s inner west claim noise and air pollution from the construction of the road project has caused depression, as well as breathing problems such as asthma. Kate Cotis, a St Peters resident for the past 13 years, has lived alongside the above-ground construction zone for months and gave evidence at the New South Wales parliamentary inquiry into the impact of WestConnex. According to her psychologist, Ms Cotis’s battle with WestConnex over the ongoing noise and pollution from the construction — and her concern over what effect the four-lane toll road’s proximity to her home will have — has led to a mental health condition. 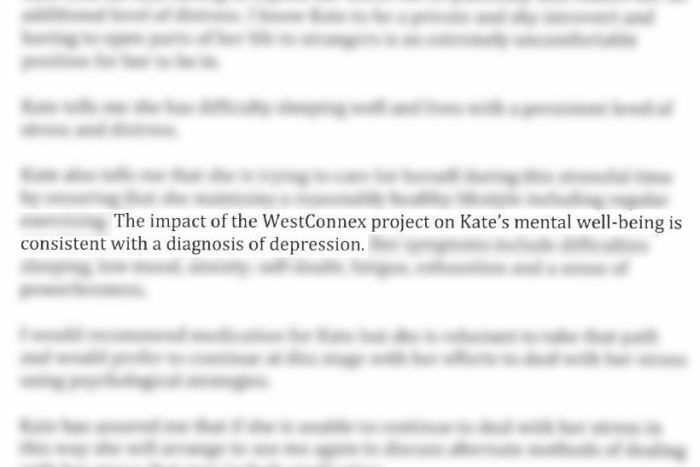 “The impact of the WestConnex project on Kate’s mental wellbeing is consistent with a diagnosis of depression,” Ms Cotis’s psychologist wrote in a letter supplied to 7.30. “It’s distressingly oppressive, just awful,” Ms Cotis told 7.30. “It’s a 24-hour construction zone. It’s dirty, filthy, noisy. “If you set that aside, we are so close to a four-lane highway, with noise increased, we will be living with constant traffic. “[The NSW] Government needs to listen, hear our distress. “We need to be properly consulted about measures offered to ameliorate noise and pollution. To date, the NSW Roads and Maritime Service (RMS), which maintains the key assurance role for WestConnex on behalf of the NSW Government, has only offered mechanical air filtration on her house by way of compensation — a measure Ms Cotis says is “inadequate”. “What WestConnex have done is bought all the homes they need to build the road, with no consideration to homes right next to this road. And that’s us,” Ms Cotis said. Inner West councillor and WestConnex Action Group co-founder, Pauline Lockie, said the project has ruined the inner west of Sydney. “You walk through St Peters now and it looks like a warzone,” she said. “There’s construction happening 24 hours a day. It’s a dustbowl because of scores of houses pulled down. Further along the construction zone in Ashfield, Rachel Brittliff and her family claim their proximity to the WestConnex construction has exacerbated their asthma, and caused asthma in their four-year-old son Ethan. “I think it’s the WestConnex construction,” she told 7.30. “There’s a lot of it, they are dust-generating activities. RMS chief executive, Ken Kanofski, defended air quality standards for WestConnex. “The air quality standards for the WestConnex project are equivalent to the best in the world,” he told 7.30. The Brittlif family, who live within 150 metres of a planned unfiltered WestConnex stack at Ashfield, said their concerns over air quality won’t end when the temporary construction phase finishes. “I agree that infrastructure projects are necessary and I accept that it’s in my backyard,” Ms Brittliff said. “What I think the most important thing is, when you are doing this in someone’s backyard, you treat those people with respect and dignity, you genuinely consult with them. Watch Andy Park’s report tonight on 7.30.